It’s about that time again for the San Diego Comic-Con and with SDCC comes exclusive merchandise. Mimoco is no stranger to exclusives as over the past several years, they’ve been releasing limited edition exclusive SDCC MIMOBOTS for show goers to pick up. This year is no different and Mimoco looks to release something special this year. This year sees the re-release of a fan favorite, Chewbacca from their very popular Star Wars x MIMOBOT line. What makes this one different is that he know includes a depiction of a disassembled C-3PO on his back, just like in The Empire Strikes Back. These will be limited to 1000 numbered pieces and once they are gone, they’re gone. You can preorder these now if you can’t make it to SDCC by heading over to their site here. For more info about this and their new series 9 Star Wars x MIMOBOT line, check out the full press release below. (Boston, MA – July 2nd, 2013) — Mimoco® (www.mimoco.com), the Boston-based consumer electronics design studio is preparing for their annual pilgrimage to San Diego Comic-Con, where in 2005 they launched their company and MIMOBOT® brand of designer USB flash drives merging art toy aesthetics with the functionality of personal data storage devices. Over the past eight years Mimoco has pioneered the licensed flash drive category with their MIMOBOT platform blooming into a veritable powerhouse showcasing dozens of pop-culture franchises and hundreds of iconic characters in MIMOBOT form and function, all preloaded with exclusive Mimory® content. Over the next month, week by week, Mimoco will let fans in on their newest collaborations – eight limited edition MIMOBOT flash drives, one for each year of their existence, each a sparkling candle burning bright in Mimoco’s metaphoric birthday cake! Mimoco continues the celebration with their Star Wars x MIMOBOT line, their longest-running co-branded licensed collection with Lucasfilm that started in 2006. 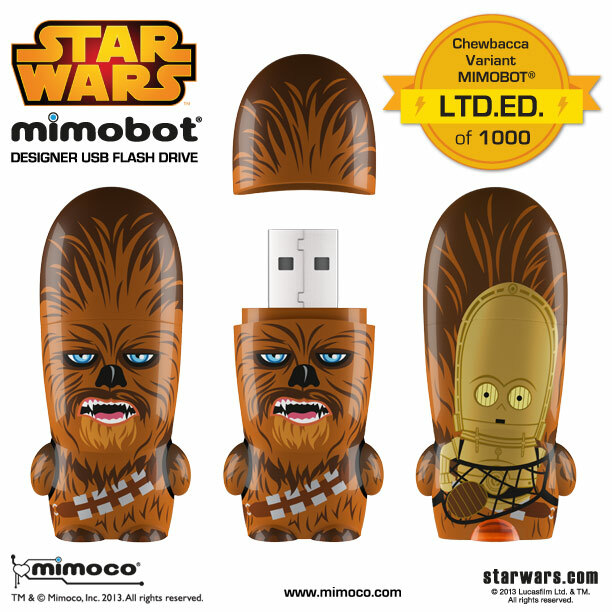 Now in Series 9, Mimoco re-releases Chewbacca MIMOBOT in a hand-numbered limited edition run of 1000 units, in up to 128GB capacities, as well as in USB3.0 speeds. As with all Star Wars x MIMOBOT drives, these will be preloaded with bonus digital Mimory® content including the MimoDesk® personalization suite of wallpapers, icons, and avatars, and the exclusive MimoByte® sound software. Chewbacca Variant MIMOBOT is a complete redesign of Mimoco’s Star Wars Series 1 Chewbacca MIMOBOT and this time around he’s brought a friend with him! The temporarily disassembled C-3PO is hanging out on the back of everybody’s favorite Wookiee spitting all sorts of complaints into his ear. This Star Wars Series 9 MIMOBOT joins dozens of Star Wars characters including the recently released Jar Jar Binks and R2-A6 limited editions announced earlier this year. But act fast because only 1000 Chewie Variants will be manufactured. A portion of the limited edition Chewbacca Variant MIMOBOT is now available at www.mimoco.com for pre-order before its official release at Mimoco’s booths in the Toy Grower section (#5338) and in the Star Wars Pavilion (#2913M) on July 17-21 at San Diego Comic-Con International. Boston-based design house Mimoco fuses the art of contemporary characters with the functionality of personal data storage devices and is well known in both the pop-culture driven Art Toy underground and the high-tech electronic world. The MIMOBOT USB flash drive line includes original characters and licenses from Star Wars™, Hello Kitty®, Transformers®, and DC Comics™, to pop-artists like tokidoki®, FriendsWithYou, to the Legends of MIMOBOT Series featuring Albert Einstein, Elvis, and more. MIMOBOT USB flash drives are available in up to 128GB capacities and USB 3.0 speeds, are Mac and Windows compatible, and include preloaded bonus Mimory™ content. Learn more at www.mimoco.com.